Bolstering warehouse capacity, the Port will have room to grow. As lawmakers in Tallahassee were working to draft legislation to establish Triumph Gulf Coast, Inc., and provide for the disbursement of reparations from the oil and gas giant BP, Wayne Stubbs was paying close attention. It became clear that the state would be looking to fund projects that would contribute to diversifying the economies of counties affected by the Deepwater Horizon disaster, projects that would add to the public infrastructure and create jobs. The port was in the midst of a strong post-recession resurgence to the point where it was experiencing growing pains and had purchased 70 acres from WestRock paper company in August 2016 to allow for the construction of a second port terminal. Work on the first phase of the $60 million terminal expansion project had begun. “Ships arriving to load product from the paper mill are getting bigger and, of course, they have bigger drafts,” Stubbs said. The space crunch was so great, in fact, that the port, Stubbs concluded, had no choice but to begin the project long before Triumph funding was assured. “We had to proceed with the project in order to stay on schedule with regard to commitments we were making,” Stubbs explained. Indeed, by the time the opportunity to apply for Triumph funding came about, the state Department of Transportation and Economic Development Council had committed to contributing $22 million to the expansion. The Corps was in for $5 million. The port borrowed $12 million for land acquisition and drew down cash reserves for additional purposes; its total contribution to the project is $23 million. From Triumph Gulf Coast, it sought $10 million. “It would be wrong to say that we were counting on Triumph funding, but we were for sure hopeful that we would get some help from them,” Stubbs said. Absent Triumph assistance, the port would have two options: expand the project timeline and “pay as you go” or borrow more money. In making application to Triumph, the port sought funds specifically for completing construction of a 260,000-square-foot forest products warehouse; building a new bulkhead; and channel dredging. It sought to convince Triumph board members that the need for the project was acute and that economic benefits arising from the project would be significant. An executive summary in the application noted that cargo activity at the port increased by 300% in the last 15 years. At the same time, the port has continued to provide facilities and space required by two large industrial tenants: Oceaneering, a manufacturer of large umbilical seafloor cable that encases hydraulic and electric line and fiber serving various functions, and Berg Steel, a 38-year tenant that manufactures large-diameter pipe. 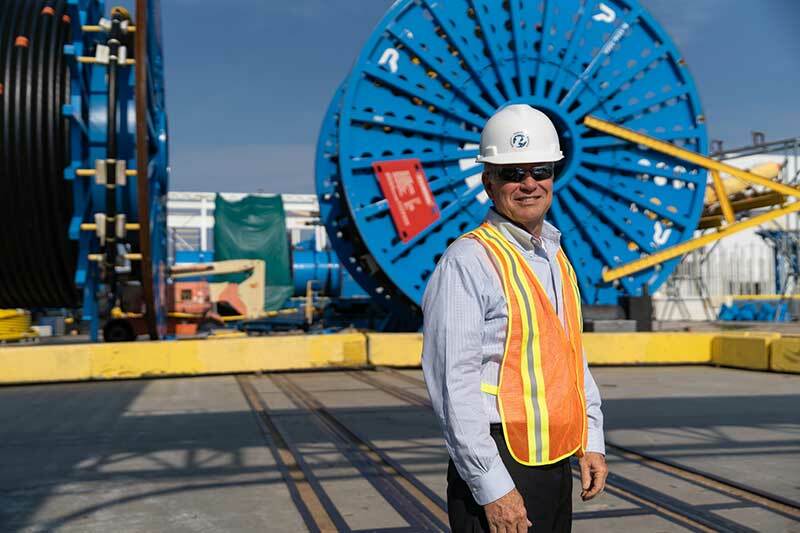 “As we approached capacity at the western terminal, it would have been nice to have had all the space that Berg and Oceaneering occupy, but they produce more of a regional economic benefit than cargo operations,” Stubbs said. Still, cargo is essential to the viability of the port. The Port of Pensacola, leveled off at about 300,000 tons of cargo annually and struggling, has had to consider accommodating new activities including a research center on port property. “In Panama City, we were at 500,000 tons in 2000 and, if you stay there, you will have a hard time surviving,” Stubbs said. The good news is that Port Panama City is growing its cargo business across the board. Copper, which today accounts for about a half-million tons of business annually, had dipped to 200,000 tons during the recession. Pine wood pellets, growing too, account for some 800,000 tons annually and are shipped primarily to the United Kingdom where they are used not for household consumption but to fuel what used to be coal-fired power plants. The appetite for wood pellets is growing in Japan and Korea, as well. Plus, wood is a renewable biofuel. The port is working to build its regional container trade and is focused in that regard on nearby markets and smaller, independent container lines versus Panamax ships that are as large as can slip through the Panama Canal and sail to ports in Asia. It is adding facilities to support refrigerated containers and is doing a growing business in cucumbers and bell peppers from Mexico. Stubbs hopes that NAFTA issues do not interfere with the good thing the port has going with Mexico and he finds himself checking headlines related to tariffs, retaliatory tariffs and other trade actions every day. Steel, in particular, among products handled by the port, has been affected. But, generally, Stubbs is sleeping better these days. The port’s $10 million Triumph application sailed through the pre-application phase, gained board approval and then, on June 12, the Triumph board signed off on a final contract authorizing use of the money. Those developments made Port Panama City the first applicant to receive Triumph funding. Stubbs found it significant that every member of the Triumph board made time to tour the port in order to better understand its activities and its application. The support of Allan Bense of Panama City, a Triumph board member and, at one time, the speaker of the Florida House, was especially helpful. Over the next 13 years, the seven-member Triumph board will dole out approximately $1.5 billion that the state will receive from BP. The disbursements will be spread among the eight Panhandle counties most affected by the Deepwater Horizon oil spill — Bay, Escambia, Franklin, Gulf, Okaloosa, Santa Rosa, Wakulla and Walton. Minimum spending levels have been established for each county. The award made to Port Panama City has strings attached. The port is required to hit at least one of three targets related to jobs generation, growth in the tonnage it handles and growth in the revenue it earns. “We plan to hit all three metrics as a matter of pride,” Stubbs said. To do so, it will both take advantage of the new capacity that will result from improvements and ride momentum that has been building in recent years. A consultant, Martin Associates, was retained by the port to establish baseline economic impacts and to assess potential economic impacts of the east terminal project. It released its report in November of last year. The port, the consultant found, handled more than 2 million tons of commodities in fiscal year 2015. That activity accounted for 2,844 direct, induced and indirect jobs in the Panama City area. Of that total, 1,256 direct jobs were tied to marine cargo and vessel activity. Further, the consultant calculated, 1,017 induced jobs in the regional economy were supported by purchases made by those 1,256 jobholders. And 571 indirect jobs were supported by the nearly $42 million in local purchases made by businesses supplying services at port terminals and by businesses dependent upon those terminals. The 1,256 holders of direct jobs received a total of $58.9 million in wages and salaries, an average of $46,892 per person. The re-spending of this income created another $115.8 million in income and consumptive expenditures. The capacity of the east terminal warehouse will be between 35,000 and 45,000 tons of wood pulp and linerboard, depending on the product mix. The annual capacity of the warehouse will range between 420,000 and 540,000 tons. The east terminal project is projected to support 148 direct jobs and 163 induced and indirect jobs. The projected total of 311 jobs will easily satisfy the Triumph board’s job-generation requirement of 250 positions. At capacity, the project is projected to create $17.8 million of personal income and local consumption expenditures and $151.6 million of direct business revenue to local firms providing handling and support services related to the approximately 534,000 tons of forest products throughput. “It takes a long time to get everyone to agree on things related to a project of this size,” Stubbs said. Indeed, the terminal expansion is four times larger than any single capital project previously undertaken by the port. “It was helpful that the port has been recognized and appreciated as a big contributor to the economy. Panama City was built as a port city and the industries that are here wouldn’t be here without it. A community can rule out a lot of potential new industry if it can’t offer some port capacity nearby. “The port is expanding its footprint and not only is it adding warehouse space, it will give them additional berth space and, from an economic development standpoint, we will have more port-related property and capacity to market,” Hardin enthused. Bay County benefits and so do surrounding counties.